Mr Ayodele Peter Fayose is the Governor Elect of Ekiti State and I hereby congratulate him and good people of Ekiti State that elected him as their next Governor. Do or Die versus Rig and Roast. Ph.D holders versus OND holders. Bourgeoisie and Proletariat: (the lowest social or economic class of a community). John Kayode Fayemi is a scholar, an intellect, an activist, a comrade, a unionist. I will not dwell much on his attributes because they are not subject of discussion. He is a governor loved across party lines due to his style and approach to party politics. I’m sure if not for the dirty dimension of our politicking in recent days; many PDP governors will attend his electioneering campaign. Three events makes him an outstanding governor for me; first was during the NGF crisis, I was reliably informed that the governors ought to have elected NGF chairman before the expiration of Amaechis first tenure as NGF chairman. But when it became clear that Amaechi will win and that might cause disaffection among members and Mr President , Fayemi Proposed that the election be postponed for two months for people to consult widely. He was quoted to have said that the media will see Amaechi victory as a victory against Mr. President. The election was postponed but the outcome of that election was not devoid of what Fayemi prophesied. Second outstanding courage of Fayemi was when he told Gov Amaechi to go and personally see and brief President Jonathan about the crisis in his state and accord him the respect as the “Father of the nation”. Finally was his outstanding debate that convinced the south west leaders to participate on the ongoing National Confab despite his party’s position not to participate. Dwelling on his past as NADECO member or brain behind Kudirat radio will be immaterial for this topic. Fayemi is a wealthy man and his entrance into Ekiti Guber race in 2007 was generally viewed as a rescue mission following the crisis that characterized Ayodele Fayose’s first term. In that rescue mission, the covenant was between Fayemi and Ekiti Masses. Bishops, human right activists, professors, okada riders, market women, civil society groups, youths, workers and artisans all identified with Fayemi. Fayemi’s performance as a governor for three and half years cannot be classified as a FAILURE when compared with Fayose’s first tenure. Many indices of comparison favors him in terms of development but the only indices that does not favor him is mobilization and management of human resource. This is the only area he failed and he paid dearly for it. Recall that during his run-off election in 2007/8, there was no single external engagement. The battle to reclaim his mandate was fought and won with Ekiti masses. Three and half years down the lane, Fayemi brought in Foreign gods alien to Ekiti masses to come and canvass for vote for him. There was total disconnection with the people. Fayemi’s life became too elitist that he will prefer to see his bourgeoisie governor friends than to engage the downtrodden who voted for him to rescue them. I have questioned the rational of leaders inviting people outside their state to come and campaign for them. Does average voter in Ekiti understand them? Can they vote for you because a stranger said so? Can you communicate in the language they will understand? How many of these elites were with Fayemi when Ekiti masses fought for him? As Fayemi broadcasts all his campaign on national television, how many Ekiti people has access to electricity and even if they do, how many will sit down at home in the morning and watch Fayemi’s campaign? In a civil service dominated state like Ekiti where workers are not allowed to watch television during “office hour”, who was Fayemi campaigning for? How many bourgeoisies from outside Ekiti will travel down to vote during election? How many bourgeoisies has voters card? How many bourgeoisies can stand to defend a vote when there is an attempt to rig? In all these Fayemi failed. The resources he spent hosting VIP’s and live telecast of his campaign and policies is enough to feed the downtrodden who are ever ready to lay down their life to defend anybody they believe in. I’m sure 70% of Ekiti masses did not watch any single live broadcast of Fayemi’s campaign. Fayemi mistook social media advocates as voters. His strategist does not tell him that keypad, Ipad and Android phone is the only weapon of cyber advocates. None has voters card and their mission is to find what needed to be corrected in the electoral process to market their profession. Bad news or exaggerated headline can make a blogger a millionaire. Fayemi forgot so easily that 90% of Ekiti masses are not bloggers and has access to none. Fayemi spent his energy wooing (buying) PDP bigwigs who fall out with his opponent forgetting that most elites have independent mind and can only cast one vote. Proletariats moves in clusters and one can influence others to vote for you. This is not same with elites. Most bigwigs that joined Fayemi’s campaign was after contract and most are the ones victimizing the poor masses snatching their lands, building castles and most of their convoys kills the poor without any condolence. How can such characters canvass the masses to vote for Fayemi? Ayodele Fayose took advantage of Fayemis failure to floor him in the just concluded election. Fayose was busy drinking palm wine, eating dodo, riding okada with poor masses, driving old women to market and even buying vegetable from them. These dared he to committed masses who felt that Fayemi has ignored them for Foreign agbada men who hover around city with air copter and sometimes, the convoys and movement of this elites impinges on the freedom of movement of this proletariat who survives on daily bread. How many voters sensitization programmes, seminars, conferences did he organize as a governor to educate his people? What was his budget for state orientation agency to educate the masses about electoral choice? 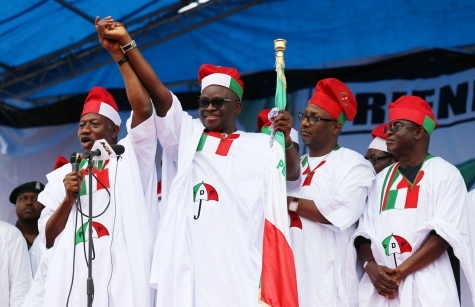 What was the electoral value of outsiders to Ekiti State? How many outsiders can convince Ekiti masses on who to vote? How many people in those stadium crowd are from Ekiti state and how many have voters card? If crowd, were fighting for rice, is that not a frightening verdict on the level of hunger in Ekiti State? How has he empowered the masses? Was there any seminar to educate the masses on when they will expect yields and dividends of present day policies of government? Ekiti State is a lesson to many who are leading us today and those who aspire to lead in 2015. Protect the rich but FEED the poor. They can bite. Fayemi is their latest victim. Fayose is their latest Victor!! !